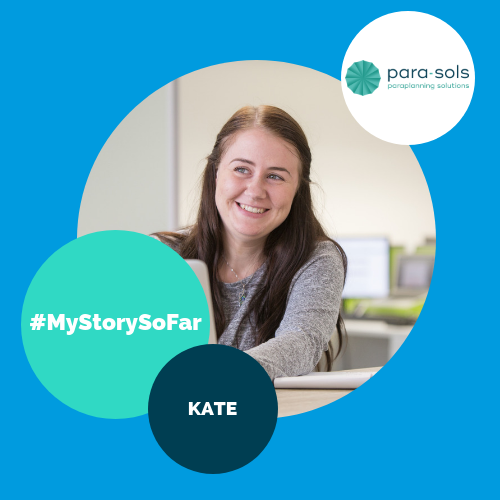 This post is all about Kate and her journey. Kate joined us in 2015 as a graduate and is now a fully qualified Paraplanner, (you go girl!). Below, she tells us how she’s got to where she currently is and why other people should want to join her. How has The Grad Scheme improved your skills? Since starting The Grad Scheme back in the Summer of 2015, I’ve obviously improved a whole host of skills – many specific to my paraplanning role but lots of generic ones too. Through experience, I’ve certainly refined transferable skills such as ‘time management’ – that’s crucial for me when managing a large number of cases – and have saw my soft skills improve as my confidence grew meaning dealing with advisers and solving problems come more naturally to me these days. What do you enjoy the most about working Para-Sols? Definitely dogs in the office! We also have Dominos lunches sometimes (which is great!) and generally just love how relaxed the office is – there’s no suits and ties here. Everyone gets along well and because we’re all so focussed, it maintains a really good balance between getting the work done but also having some fun whilst doing it. What qualities would you say are the most important when applying for The Grad Scheme? You have to have good initiative; being able to get on with tasks independently is very important in this sort of environment. It’s important to be hard-working and have an eagerness to learn, you will get all the support you need from the team but you also have to put the work in! How far do you think you have come, career wise, since starting The Grad scheme? I feel as though I have progressed miles within my career since starting here! In the past all I had done, job wise, was waitressing – now I’ve got a Level 4 Diploma in Regulated Financial Planning! I like that there is clear progression in the role that you have and this becomes easier to understand the longer you are here. In your opinion, why should people apply for The Grad Scheme? It’s really unusual from my experience, that you would be accepted and have an opportunity in a specific sector without previously being involved in the job role or field – which can make it really hard to break into the sector. I like that Cathi (our Founder & Director) is open minded and is great at spotting potential in people, giving someone with no experience, but the right attitude, an opportunity. As I mentioned before, the career progression is amazing and the support you receive whilst working through your Diploma is just fantastic. The office dogs, pizza lunches and ‘Wine Friday’ are just the icing on the cake!